Now that’s a scary notion, at least for some people! Just think about that one for a moment… Often times our moods dictate what we eat. You can look at emotional eating in one of two ways; (1) I choose to eat certain things because I am in the mood for that particular food, or (2) I choose to eat something or eat compulsively because my moods tend to set off certain negative thought patterns which lead to food being my built in psychological coping mechanism or comforter if you will. Which one best describes your emotional eating? Of course the first type of emotional eating suits most people just fine and is not detrimental. This type of emotional eating allows the “eater” to dictate the outcome of what they choose to eat, how much they eat and their ability to stop eating at the point of satiation. The second type of emotional eating however is the damaging type. Emotions and mood swings trigger or create eating habits that are completely out of control. Several things happen which places the person in “harm’s way” for eating. First off, the eating can become addictive. Can food/eating become addictive? Absolutely! What happens is the individual becomes a compulsive eater (over-doing it) or they become a restrictive eater whereby they develop an eating disorder such as anorexia nervosa, bulimia or reverse anorexic (megarexic – bodybuilder type who is out of control). When things get out of control for this type of individual, they develop clinical mental health problems. Second, emotional eating can lead to the consumption of junk foods and negative calorie types. Some individuals become addicted to fast food preparations that are unhealthy. They choose foods that are fatty, greasy, empty caloric, filled with processed sugars and starches, unsaturated fats and chemicals, and food additives. Interestingly, it is not actually the foods only they become addicted to in terms of taste and consumption, but also what the foods contain. Certain food additives and chemicals affect the brain – sugar, MSG, caffeine, colorings and other things too difficult to read/spell. It is these “things” which compels some to continue to eat regularly much the same way a cigarette smoker gets hooked not only on smoking cigarettes, but the nicotine as well. Third, some people eat out of boredom and depression. In clinical depression patients (chronic depression and/or bi-polar) it is quite common for them to indulge in large amounts of calorie consumption to comfort them. Even though the thought processes differ for everyone, the food provides a means of creating a sense of peace and contentedness. Conversely, depressed individuals may consume large quantities of calories and junk foods as a means of punishing themselves. They eat to add to feelings of worthlessness, low self-esteem and “badness“. They have either been told or they believe they are; “fat“, “ugly” and “worthless” and this is their way of reaffirming their irrational beliefs. Finally, some people eat out of thriftiness. How can eating be thrifty? Interesting question! Some people engage in eating “to get their money’s worth“. They choose buffets on a regular basis because they are on the cheap and they believe the more they eat, the more bang they are getting for their buck. Furthermore, those spending a lot to eat at an expensive buffet often times “feel” obligated in getting their money’s worth. So, basically they feel the need to make sure they eat their $25 worth of food even though they are busting at the seams! There are a host of reasons people over-eat or become addicted to eating. We have only scratched the surface. 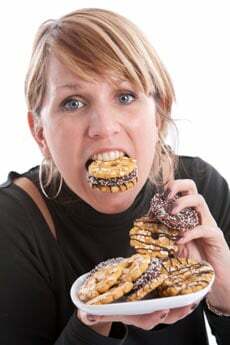 We will examine the reasons and explain the “how’s” and “why’s” in a series of articles to follow on emotional eating. Emotional eating disorder is more widespread and fundamental to weight issues than most people think. If you’ve suffered in the past with weight control there is a good chance some kind of emotional eating condition is at the root. Because of this Free At Last Hypnosis tackles this issue in all its weight loss clinics. Find out more about our Weight Loss Programs in Mashpee Area here.